This article is a short summary of Mario Pinball Land. 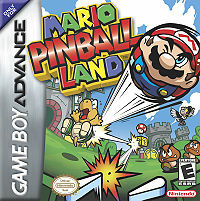 Mario Pinball Land, also known in Europe and Japan as Super Mario Ball, is a video game released for the Game Boy Advance in 2004. It is a pinball game with a Super Mario theme that uses the titular hero, Mario, as the ball, making it similar in concept to games such as Kirby's Pinball Land. It's a Mario Adventure with a Spin! What starts out as a fun day at the fair ends in disaster when Princess Peach gets flung far off into Bowser's Castle! In order to save her, Mario squishes himself into a ball and blasts across the Mushroom Kingdom. Now, he's ricocheting off Goombas and Koopa Troopas and collecting the magical Star Keys in a pinball adventure unlike any other! While Mario and Princess Peach are at the Fun Fair, a Toad demonstrates to them a machine that transforms the user into a ball and launches them from a cannon towards a target. When Peach tests the device, however, a pair of Goombas turn the cannon around, making it launch her straight into the evil Bowser's castle instead. Determined to rescue her, Mario steps into the machine as well, turning himself into a ball and setting out towards the Koopa King's castle. This page was last edited on 8 December 2015, at 16:51.